This month's quiz- You're stuck in the desert, should you walk to a distant farmhouse for help?Scroll down for the answer! 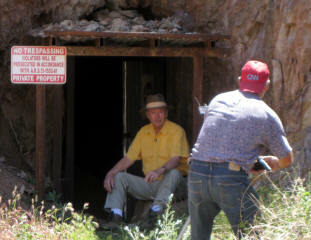 Carefree (PW)-CNN producer Amy Ambatielos had heard about it in a blog, an historic gold mine in Scottsdale, Arizona, and right away she thought it would make a nice feature for CNN Money. 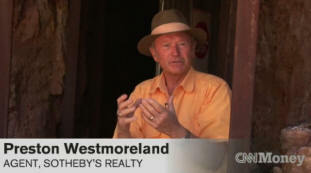 The network put the story on a fast-trac and assigned photographer Stevan Pope to do the story in late April for the network's "Unique Homes" feature. Although there are no homes on the property, she thought it was such an unusual offering, it would make for an interesting piece. The story was on CNN Money before the end of the week. Gold Hill is a 117 acre mine property that is not only the largest land offering in Scottsdale, but is the most expensive listing in all of Maricopa County. Since it's discovery in 1874, the property has earned a reputation for one of the biggest mines in the area. In Francis Carlson's book, "The History of Cave Creek and Carefree," there's an entire chapter devoted to Gold Hill. the Annual Christmas Lights Parade and much more! Carefree (PW)- If all the signposts are correct, we should be heading for a wonderful recovery in the Arizona Real Estate Market, but somebody forgot to tell the buyers! We hear that Phoenix is in the Top Five of real estate markets to make the best recoveries. Our inventory of homes for sale is at near-record levels (see the Real Estate Stat Box on this page) On April 24th, the USA Today (story below) reports Phoenix is one of the few markets with prices increasing. Zillow predicts the home prices in Phoenix will rise over 6% this year. And finally, the Arizona Republic reports Carefree and the area surrounding it are the two hottest real estate zipcodes!!! So what's the problem? It seems travelers from other locales have been so conditioned to properties with glued "For Sale" signs, and stubborn, unmotivated sellers, that the guiding principle seems to be "throw a bone to an Arizona home owner, the house will still be there." How many "Dear John, you lost another one-letters" will it take to re-educate home shoppers? Slowly, things are beginning to change. Amazed purchasers in the N.W and S.E. portions of the Phoenix area are shocked to see multiple offers on most of the lower-priced homes, lookers have been in a line of realtors to get into a home on lock-box. The Arizona Republic recently reported 26 offers were piled up for one home there. And sellers are doing an old trick not seen since the hey-deys of 2005-taking offers for a week and then picking the best one. I've had home shoppers who love the Tonto Hills area look at all the houses, then decide what kind of low offer to put on the properties, only to see house after house go under contract and close escrow. And we're also seeing something new-homes under construction. (photo below) One residence being built in Carefree is listed for $525,000. And finally, lots are selling again. One 1/3 acre home site in the Boulders sold for $ 259,000, a choice parcel in Desert Mountain went for $1.3 million, and a teardown home on a lot in swanky Paradise Valley sold for $ 4 million dollars with multiple buyers trying to get it. Doomsayers still like to believe that the huge "shadow inventory" of bank-owned homes looms over all of us, ready to crash into the market like an asteroid, but many in the banking industry says "not so. This rumor pops up every year." Experts say the bottom was reached in Phoenix around October of 2011. Advice to home buyers now-have your financing in order, money ready, and lock-in to the home you like, or it will become someone else's! Home prices continue to fall but there are small signs of improvement. Nationwide, prices fell 0.8% in February, the sixth-consecutive month of price declines, according to the Standard & Poor's/Case Shiller index released Tuesday. When adjusted for seasonal factors, prices rose 0.2%. The latest Federal Housing Finance Agency index shows home prices rising 0.4% for the 12 months ended in February, the first 12-month increase since July 2007. "Home prices are slowly bottoming out," says Steven Ricchiuto, chief economist of Mizuho Securities. The Case-Shiller index shows February's prices were 35% below their 2006 peak. March numbers appear to be stronger, says Stan Humphries, chief economist of Zillow. A report it's releasing today shows home prices rising 0.5% from February to March, the largest monthly increase in almost six years. Nineteen of the 30 markets covered by the Zillow forecast will bottom in 2012, or already have, Zillow forecasts. Nationally, home prices will fall 0.4% in the next 12 months and may bottom in late 2012, Zillow adds. Markets will hit bottom at different times, economists say. •The FHFA index, which includes fewer distressed homes than the Case-Shiller data does, shows prices are holding up better in markets with fewer distressed homes, says Patrick Newport, IHS Global Insight economist. •Prices are picking up in some markets especially hard hit by the foreclosure crisis. They have risen for five months in Phoenix, including a 1.2% gain in February, Case-Shiller data show. Miami posted a 0.6% monthly increase. Zillow forecasts Phoenix will see a 6.5% gain in the next 12 months, the nation's best home price appreciation rate. Strong demand from investors and increasing demand from regular buyers — coupled with a low supply — is driving prices in Phoenix, says Michael Orr, real estate expert at Arizona State University. Miami will follow Phoenix, with a 5.6% gain in the next year, Zillow says. Phoenix and Miami both suffered huge price declines but are attractive to second-home buyers and investors, Humphries says. See survival and flash flood info next in our Summer issue photo below. Click on the photo and see rare video of a flash flood beginning, on this Carefree wash! UPDATE! House with ruins sells for $385,000 "An archeological treasure! "Carefree (PW) Veteran realtors who had seen thousands of homes in their career, never saw one like this. Sure, there are a lot of nice homes out there with great remodel potential, some of some spectacular views, but not many border the National Forest and almost none have ruins of an ancient Hohokam village with 30 rooms or more, dating back to 1100 AD! And all this in a residential area. The previous owners did not allow several TV stations to do a story on the property and the address is being withheld. These kinds of remarkable properties showcase the kinds of discoveries one can find in the desert foothills, North of Scottsdale. 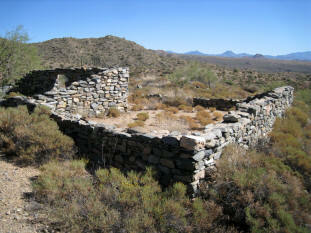 The residence, which sites on a picturesque bluff, contains almost 6 acres of land and with the help of the Pueblo Grande Museum, and countless volunteers, the walls and ruins have been stabilized and the site registered as one of the most important local Native American sites around Phoenix. The home was listed for sale for $ 449,000. Fifty-three Street Signs Replaced in Carefree-Old signs get stolen! 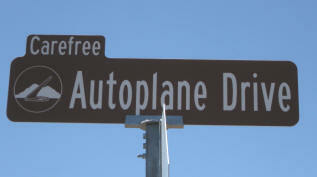 from The Sonoran News-Carefree – In an effort to promote Carefree and assist people with knowing they’re actually in Carefree, signs continue to be a hot topic amongst Carefree Town Council. With Councilman Marty Saltzman absent, council voted 4-2 (councilmen Jim Van Allen and Mike Farrar dissenting) authorizing replacement of 53 street name signs within the town core center at a cost not to exceed $3,500. According to Vice Mayor Melissa Price (l), the signs would be part of setting up an identity for the town with the uniformity of the sundial. The signs would also have reflectivity three times higher than the current signs for better visibility at night. Town Administrator Gary Neiss said the current signs have a life of up to two years. However, he said some with whimsical names are often shorter because they get stolen. Van Allen suggested the town auction the old signs off, while Price recommended selling them at the visitor’s center. Councilman Arthur Gimson said he supported the entire concept but stated he would like to see the sundial logo a little larger. Councilman Glenn Miller said the old signs could be saved for replacements throughout other parts of town, using Carefree Drive as an example of a road that continues beyond the town core center. Answer to this month's quiz- If stuck in the desert, should you try and walk to a farmhouse for help? This can be one of the worst decisions you could make. Searchers will almost always find your vehicle first. Military troops are taught to multiply by 2 or 3, estimated distances in the desert, since the clear air and low humidity can make distant objects seem much closer. You might be walking for days! April marked a number of activities in Cave Creek and Carefree. The big Fiesta Days Rodeo and Parade, thousands in town for Bike Week festivities, a chocolate festival along with Arts and Crafts....and that was all on ONE day! Glendale car dealer Buzz Sands donated the classic Chevy for the parade. Even people in the crowd look the part! Wyatt Earp visits?